The Auburn Gresham neighborhood has one of the City’s highest rates of homeowners. Its housing stock is mainly single-family homes and two-flats. It is also home of Chicago’s 10th Bungalow District. Along with two-flats, these lovely bungalows are being rehabbed and reclaimed all over Auburn Gresham bringing back the vibrancy the neighborhood was once known for. Additionally, in recent years two new senior facilities and a new veteran’s housing facility have been built to house some of our most valued residents.In 2014, through the generous support of the Richard H. Driehaus Foundation, Landmarks Illinois and Neighborhood Housing Services of Chicago (NHS) partnered to create the film The Pillars of Auburn Gresham. This 18 minute film is a video history that focuses on Auburn Gresham treasures as seen through the eyes of neighborhood stakeholders that have lived or served in the community over the last 40 years. Historic and current uses of these treasures are covered in the narration. Treasures include places, people and property that make Auburn Gresham a returning neighborhood of choice. It can be viewed on YouTube or on the Auburn Gresham page. The Levin Park Neighborhood is a tight knit community that is both accessible and affordable. Located in the heart of Austin, the Levin Park Neighborhood is home to great schools, green space, historic homes, and passionate neighbors. Additionally, Levin Park is extremely accessible to shopping, entertainment, and employment in Chicago and the western suburbs. For a limited time, homebuyers can take advantage of thousands of dollars in down payment and rehab assistance. Seize this once in a lifetime opportunity and join us in building a bright future for you, your family, and Levin Park neighborhood. Belmont Cragin is the Latino community in the Northwest Side’s bungalow belt, an evolving neighborhood that retains the character of its Eastern European roots. 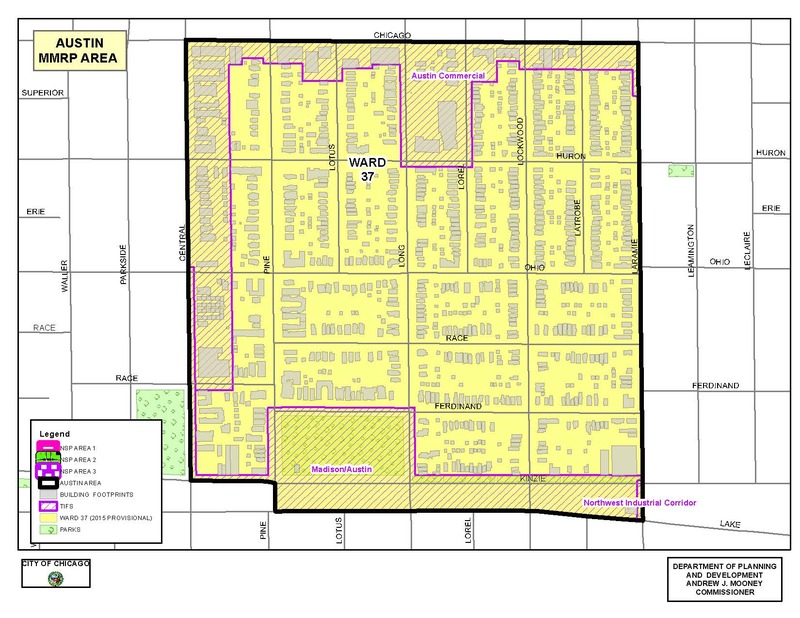 Belmont Cragin has approximately 78,000 residents, 1/3 of which are under the age of 19. We have a strong residential market comprised mostly of 1-4 flats and are about 50% homeowners 50% renters. We have a vibrant business community with Brickyard Mall and several local Polish and Latino businesses. We have high performing Chicago Public Schools (all of our elementary schools are level 1 and our high schools are level 1 and 2). Belmont Cragin is the ideal neighborhood to live, work, and worship. The Belmont Cragin community area contains a rich history of integrated Hispanic and Polish neighborhoods with a commercial center running along Belmont Avenue. The Brickyard and Bricktown shopping malls in the northwest of the community area have drawn shoppers and retail revenue in recent years. Today, Spanish Coalition for Housing is leading the housing advocacy efforts in the Belmont Cragin South MMRP Target Area, assisting new first-time homebuyers with housing counseling and renovating many beautiful Bungalows, Cape Cods, Queen Anne homes and two-flats. Chatham’s legacy as a middle-class community helped it fare better than many of its south side neighbors during and after the housing crisis. Bolstered by strong community organizations and churches, Chatham has weathered market fluctuations and more recently been chosen for retail and residential redevelopment. East Chatham offers a wide range of housing options from bungalows, to brick two and three-flats to large courtyard rental buildings. These options make Chatham a destination for people looking to get the most for their money- for students at nearby Chicago State University, for young and growing families, for former residents looking to return to the city, and for people looking to own their first home. With high building density and little vacant land, it is also an opportunity for small developers interested in providing quality rental housing to achieve the scale that they desire. Many of these properties available for already affordable prices are made even more accessible through targeted MMRP purchase assistance and rehab financing, as well as take out financing options through partner organizations. Come down and see why people are choosing Chatham for their next move. 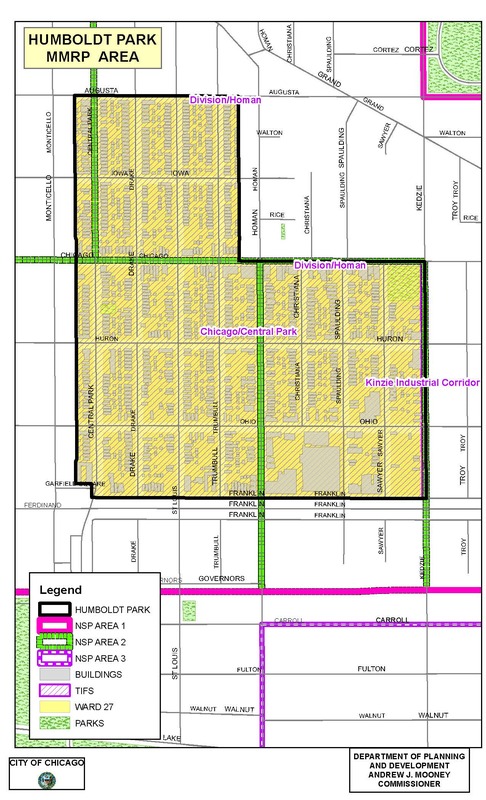 The Chicago Lawn MMRP is located in the Chicago Lawn Community on Chicago’s Southwest Side. Long recognized as a strong working class community, Chicago Lawn is now very racially and culturally diverse. The solidly built residential housing stock features classic Chicago Bungalows as well as other well-crafted single family and 2-flat homes. 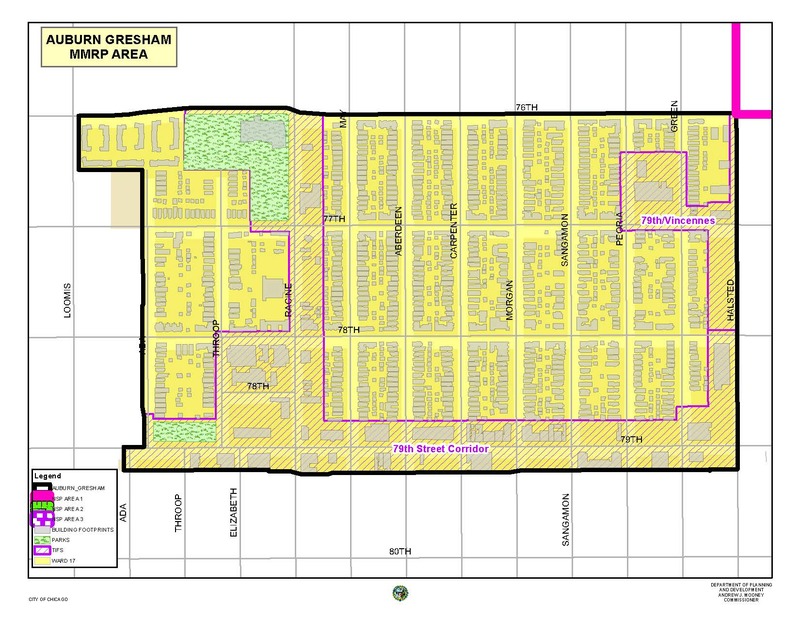 The active commercial corridors feature ethnic restaurants, specialty shops, and a 200-bed community hospital. Marquette Park is a significant resource to the community which on weekends is full of activities from soccer and golf to fishing and family picnics. The community is well served and accessible to public transportation via the Orange Line which connects residents with the Loop in 20 minutes, and Midway Airport and the Stevenson Expressway (Interstate 55) which are both minutes from Chicago Lawn. Home to more than 38,000 people, the Garfield Park neighborhood is rich with history and offers considerable assets that are growing a healthy community. This diverse community is comprised of people of many incomes and backgrounds that have become neighbors. Minutes away from downtown Chicago and well-served by transit lines and highways, the historic West Side neighborhood has caught the attention of developers, investors and homeowners. 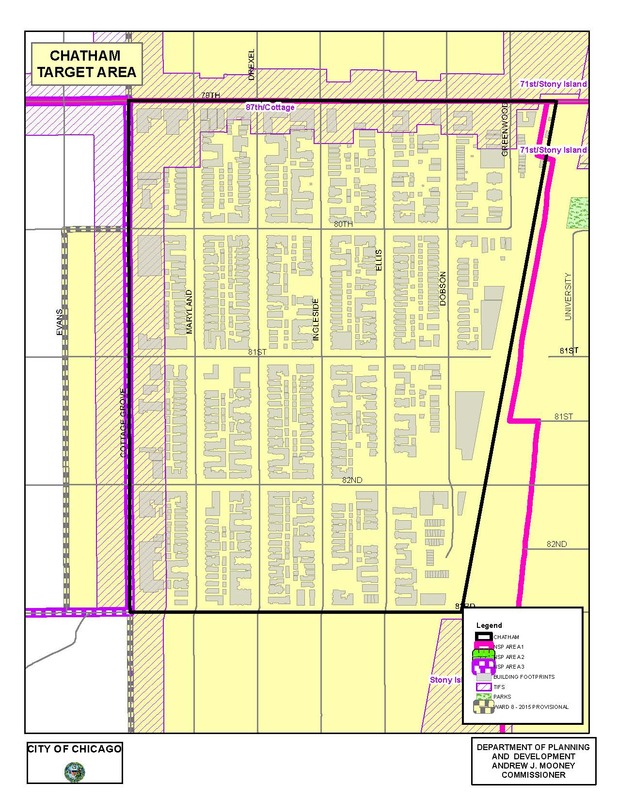 The designated East Garfield Park MMRP housing area is bordered by the 185-acre park that serves as its western border and is adjacent to Chicago landmarks like the Golden Dome fieldhouse and the Garfield Park Conservatory. Many of the homes in the MMRP area are beautiful greystone homes near both the mosaic-clad elevated station on the CTA Green Line or the Blue Line. The MMRP area also includes several community gardens and the bi-weekly summer Farmers Market. This community is recognized as a “green” neighborhood where gardens, landscape businesses and environmental land uses are commonplace. 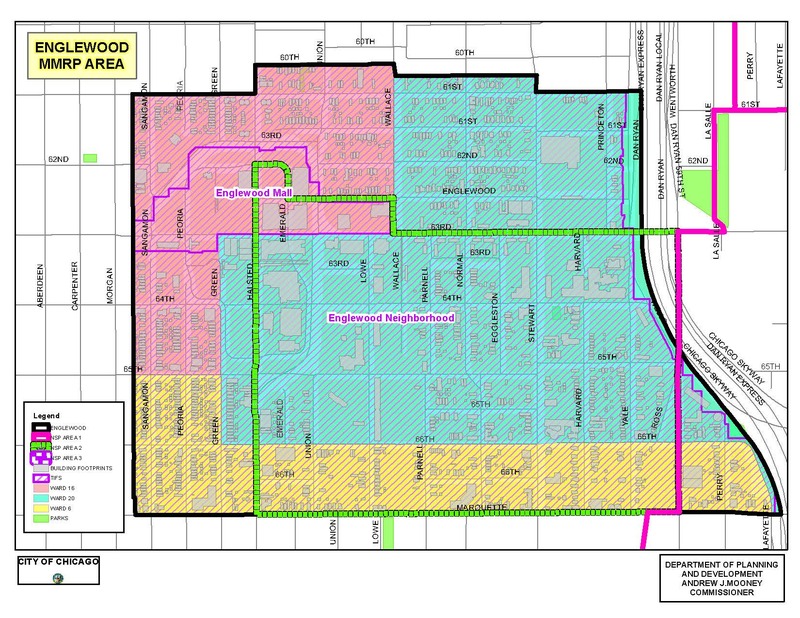 Englewood’s MMRP is a community located approximately 7 miles south of downtown Chicago on the South side. It is a mixed income community that is predominately African-American. Historically, it was the site of the second largest shopping district in the City of Chicago (located at 63rd and Halsted). Currently, the community is experiencing renewed interest from commercial developers and community partners. Englewood Square Shopping Mall, a commercial development at the intersections of 63rd and Halsted, will be the location of a newly constructed Whole Foods, Chipotle, and Starbucks, etc. Nearby is one of the City’s finest colleges’, Kennedy King College. The college is host to a state of the art culinary & hospitality school and restaurant named, Sikia. Kennedy King is also home to a radio – WKKC (89.3) and television station – WYCC (Channel 20). Another major project to highlight is from, St. Bernard Hospital, a community institution that has been in Englewood for over 100years. A state of the art Ambulatory Care Center will open in the summer of 2016. 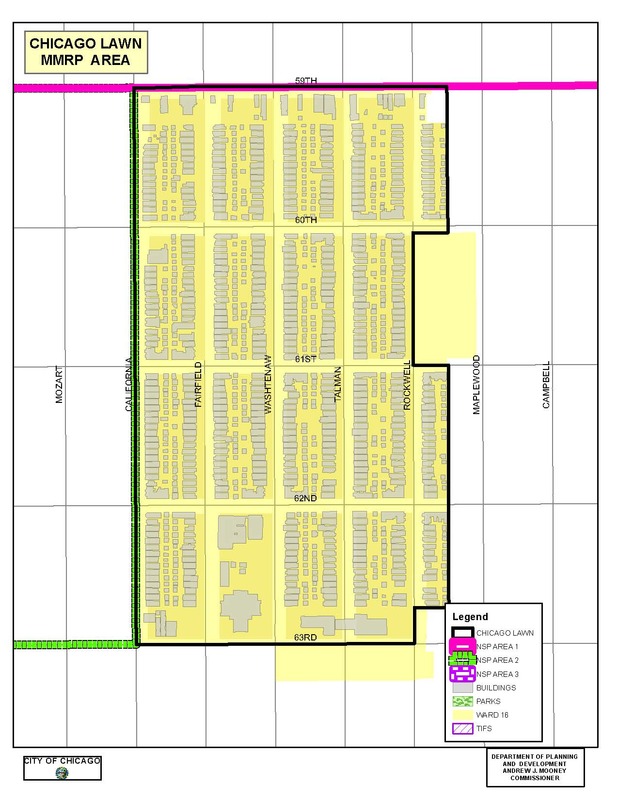 The Grand Boulevard Community MMRP area is located on the Southside of Chicago. Grand Boulevard is known for the Harold Washington Culture Center, Washington Park, Gallery Guichard and much more. The tight-knit community has long time residents who have been around since the 50’s, 60’s and 70’s. Grand Blvd is also known for Historic Greystone buildings and beautiful condominiums that have been built in the recent years. Washington Park is known for the summer softball and soccer leagues, the Universal Soul Circus and the DuSable Museum is just steps away. Grand Blvd has restaurants such as Uncle Joe’s, H-Dog’s, Peaches and Chicago’s Home of Chicken & Waffles. The majority of Grand Boulevard's public transportation needs are met by the Chicago Transit Authority (CTA), which provides resident and visitor access to the Green Line services of the Chicago Elevated railway rapid transit, at Indiana, 43rd, 47th and 51st and the CTA Bus service on King Drive and the other major streets and boulevards which are minutes from the Loop. For the past century, the Pullman neighborhood has played an important role in the history of urban design, transportation, labor, and race relations. Today, Pullman stands as a unique Chicago community located 15 miles from downtown and adjacent to Lake Calumet. It has been designated a national landmark as well as been recognized as one of the nation’s 10 Great Neighborhoods. The lead North Pullman MMRP Partner is Chicago Neighborhood Initiatives, which they remain focused on investing and renovating row housing, attracting diverse employment and retail choices, and increasing recreation opportunities. The Maple Park community is inundated with amenities that is unlike anywhere in Chicago. This is one of the only areas that is surrounded with multiple assets such as transit access, recreation, and shopping, industrial, and excellent housing stock. Since 2012, the Maple Park MMRP Team (Far South CDC, Chicago Neighborhood Initiatives (CNI), Neighborhood Housing Services (NHS)) have focused their efforts in the revitalization of single-family housing. Within 10 minutes, residents will have complete access to three major expressways (I-57, I-94, I-90) with direct access to I-57, and access to one of Chicago’s major local street arteries: Halsted Street. As for public transit, there are seven bus and rail routes serviced by Metra, CTA, and PACE. In 2012, Maple Park became the home of the 33-arce, $80 million Ray & Joan Kroc Recreation facility, which includes an in-door and outdoor track, football and baseball field, in-r water park, and much more. 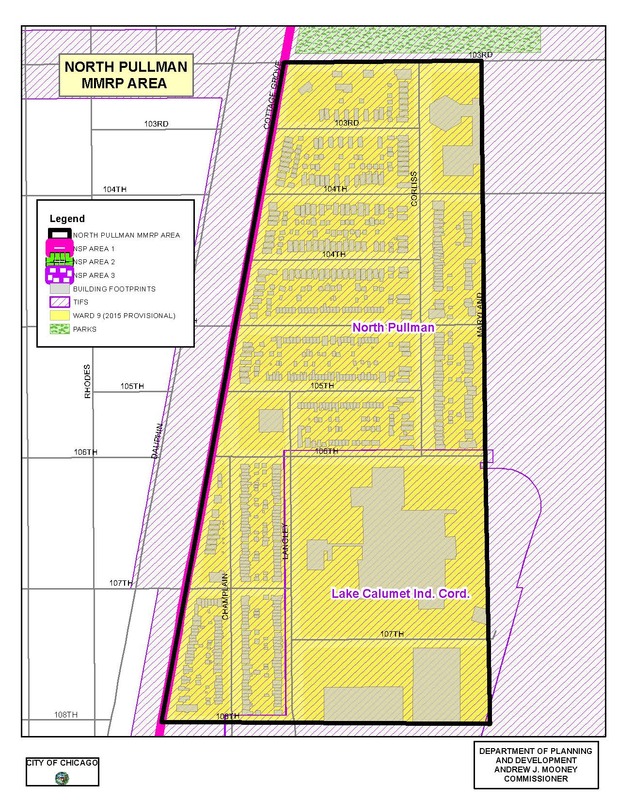 Other assets in the Maple Park community includes: 488,000 square foot shopping mall: Marshfield Plaza, 20,000 Exelon Solar Farm, which is the largest urban solar farm in the United States; new West Pullman Library; (3) industrial corporations; Christ Universal Temple campus; and an 18-hole golf course five minutes south of Maple Park. Since the inception of the City of Chicago Micro Market Recovery Program (MMRP) in August of 2011, West Humboldt Park NHS has focused on the 500 block of N. Central Park as a turnkey strategy for creating visible improvement that will reverberate throughout the target area. The new family who will call 544 N. Central Park their new home closed on their NHS Purchase Rehab Loan, which leveraged TIF, MMRP and NSP incentives, to do a gut rehab of this vacant, classic Chicago brick two-unit. This marks the last of eight properties that all once stood vacant and forgotten nearly 4 years ago in this highly visible entryway into the West Humboldt Park Community. 540 N. Central Park, 546 N. Central Park and 550 N. Central Park were all renovated by NHS and now provide affordable high-quality rental apartments for Veterans with Children – all six of these modernized apartments are now owned and managed by partner ChildServ. The full renovation of 536 N. Central Park is nearing completion and the new owner-occupant should be moving in before Thanksgiving 2015 – the family also used NHS Purchase Rehab financing along with various incentives available through the MMRP. A second priority for West Humboldt Park MMRP area is to turnaround long-standing vacant multi-family buildings. 3550 W. Franklin (17 units) is now fully rehabbed and occupied thanks to the intervention of MMRP partner Community Investment Corporation (CIC) and 3600 W. Franklin (63 units) is under rehab, owned by Pangea, with CIC assisting with financing. Lastly, as NHS and partners led the market in the right direction, good private investors followed, and now 529 N. Central Park is beautifully rehabbed and professionally landscaped and provides more affordable rental housing for West Humboldt residents.